I would suggest that you read this post before you start to make Your card. 1. 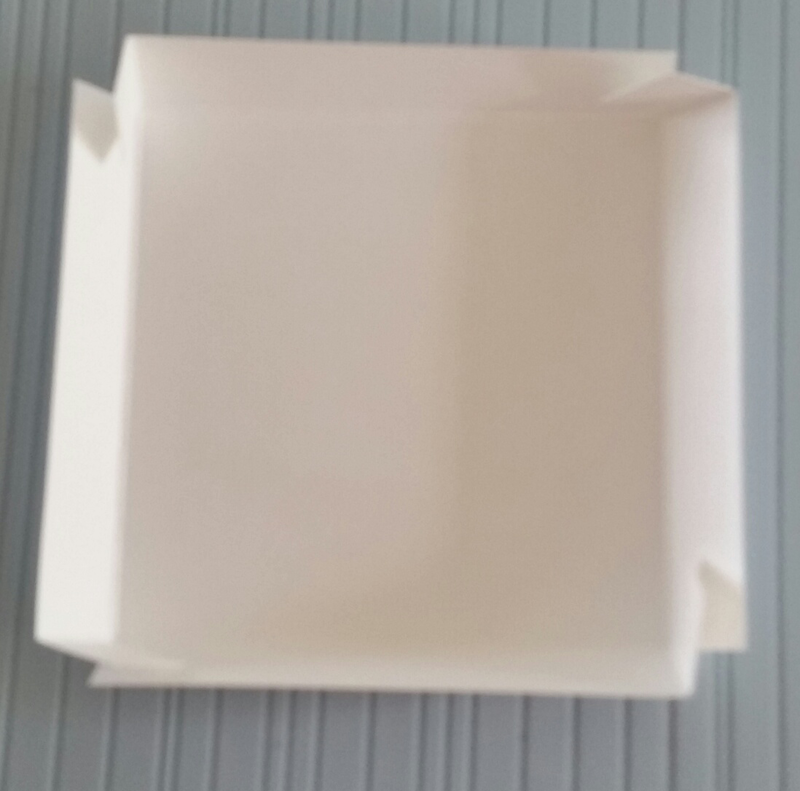 30cm x 30cm ark of paper for the Box you will need extra for the lid. 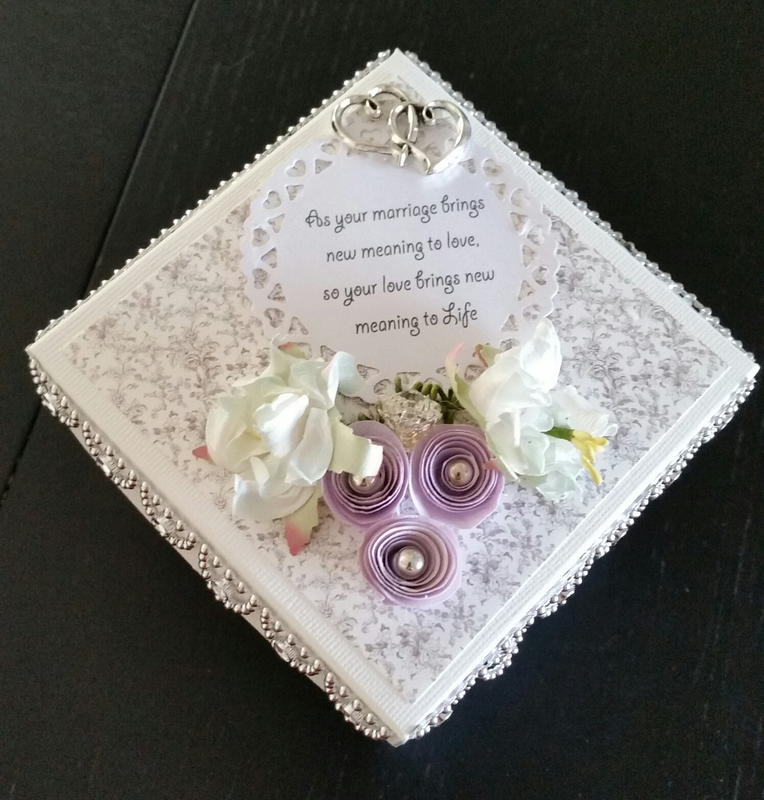 Decorations of flowers and ribbon. 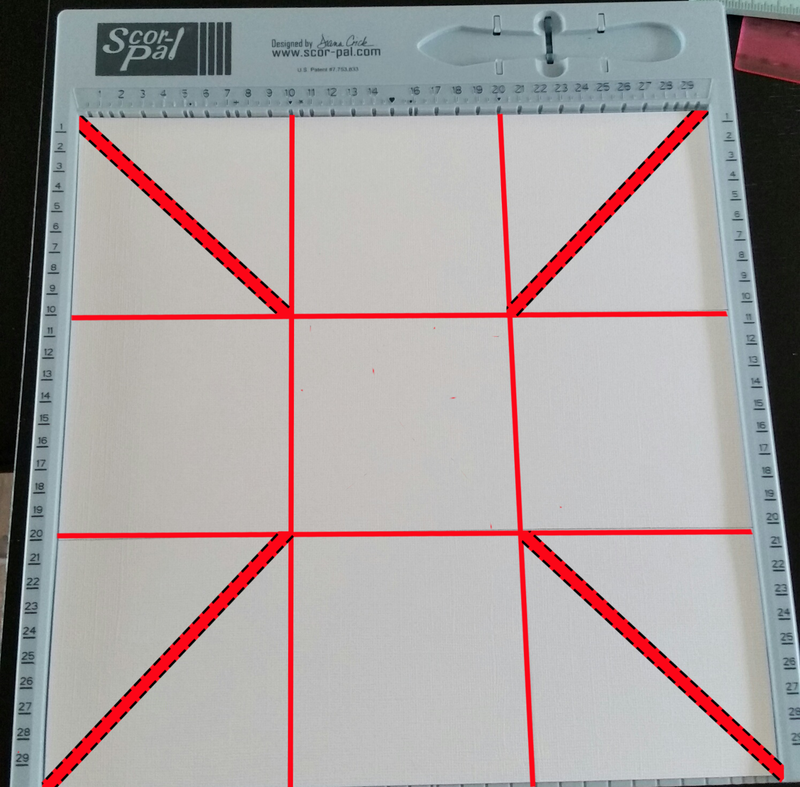 Then you need to score your paper every 10cm first from the top then turn and score from the sides.........as show by the red lines in the photo below. Now you should score from corner to corner .......as shown by the green lines in the photo below. 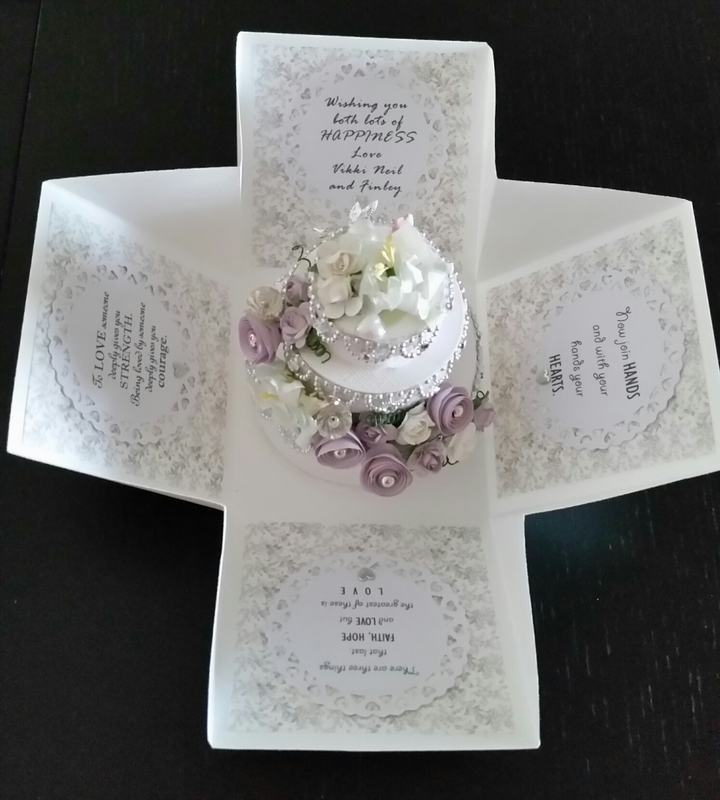 Your card should look like the photo below. The red lines show where you have now scored. 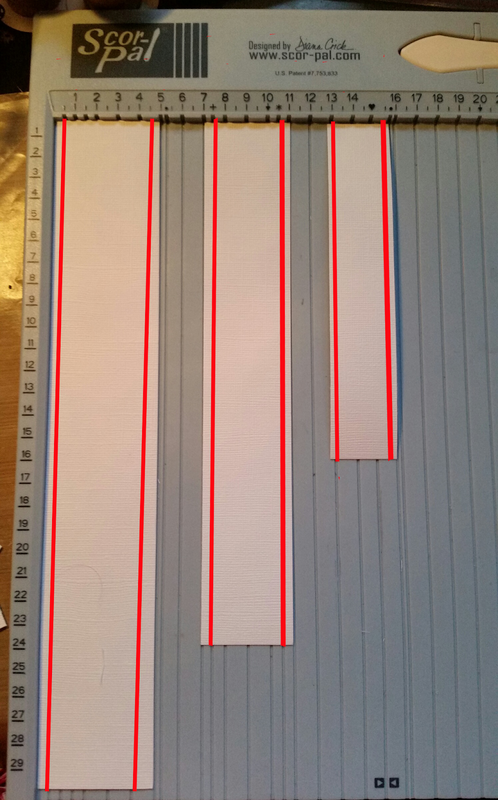 This is what is should look like once Your corners have been cut. (Sorry it's a little hard to see where the score lines are)....shown in the photo below. 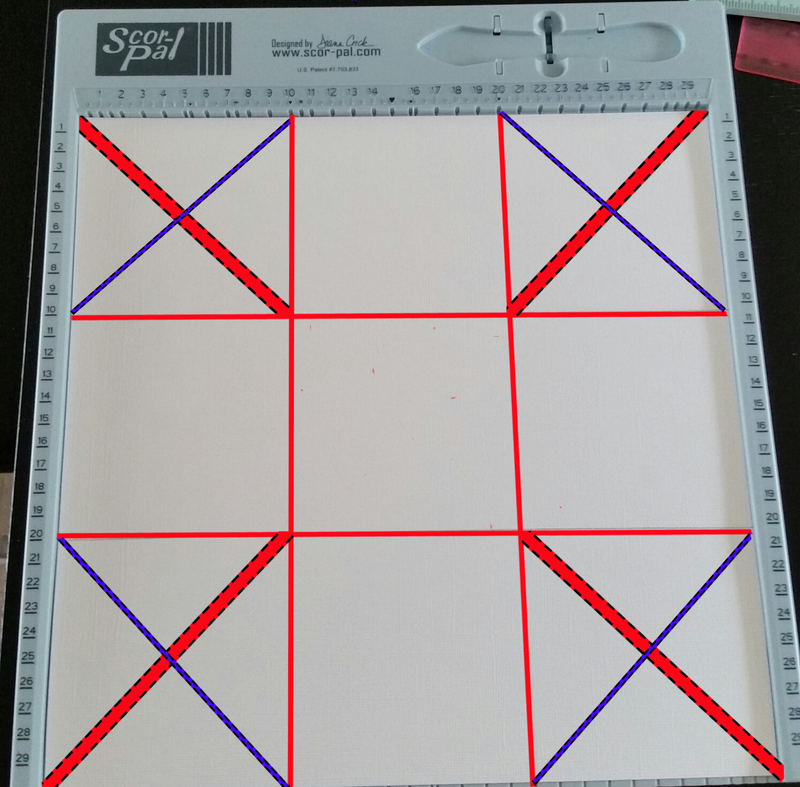 You are now ready to form the base of your box by folding all your score lines. So now you have made your base it's time to make your lid. 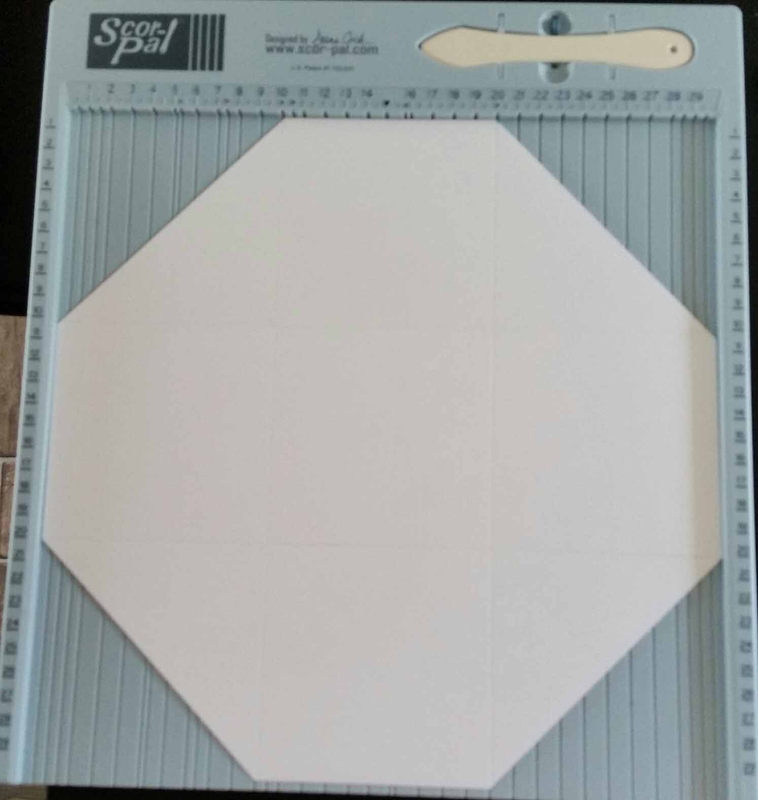 Using the same type of paper or thin card you will need a piece measuring 14,8 cm by 14,8 cm. 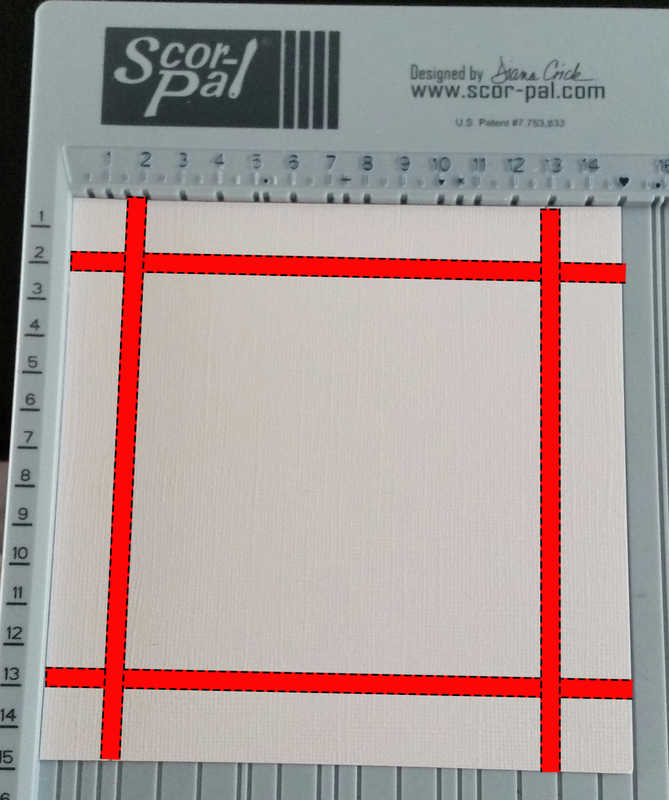 Using Your scor-pal or bone folder score the first 2cm......as shown by the red lines on the photo below. 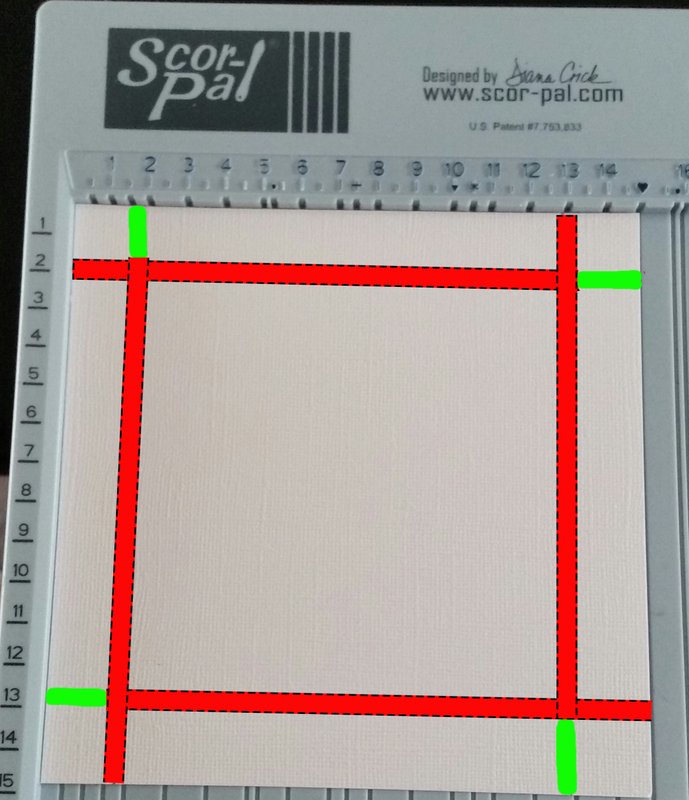 Now Clip the lines in the corners......as shown by the green lines in the photo below. Your lid should look something like the above photo. Now glue all the corners together. I use small pegs to keep them in Place whilst the glue is drying.........As shown in the photo below. You now have your cake Box. All you have to do is now make your cake and decorate it. 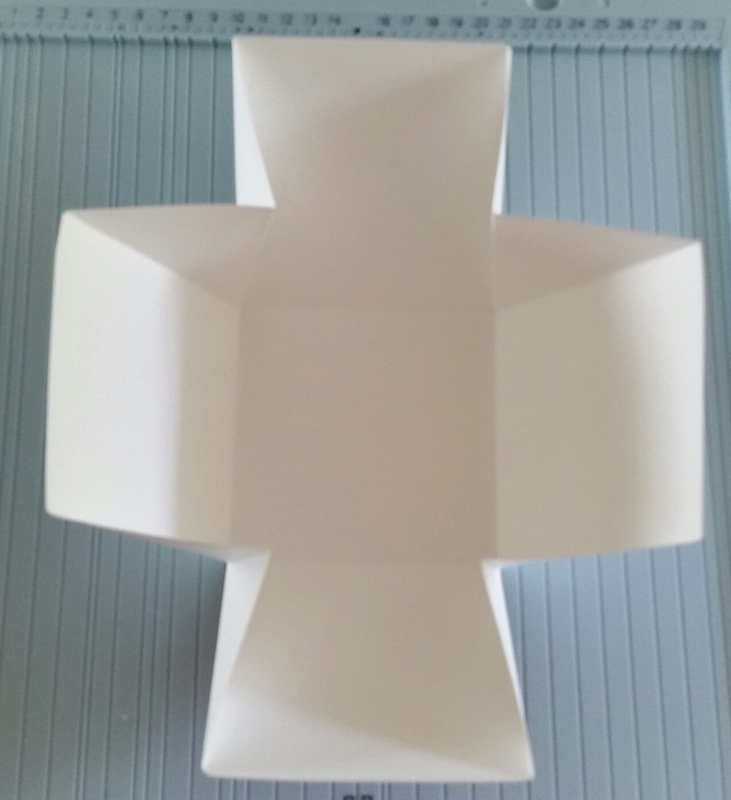 1 piece of 16cm x 3 cm. 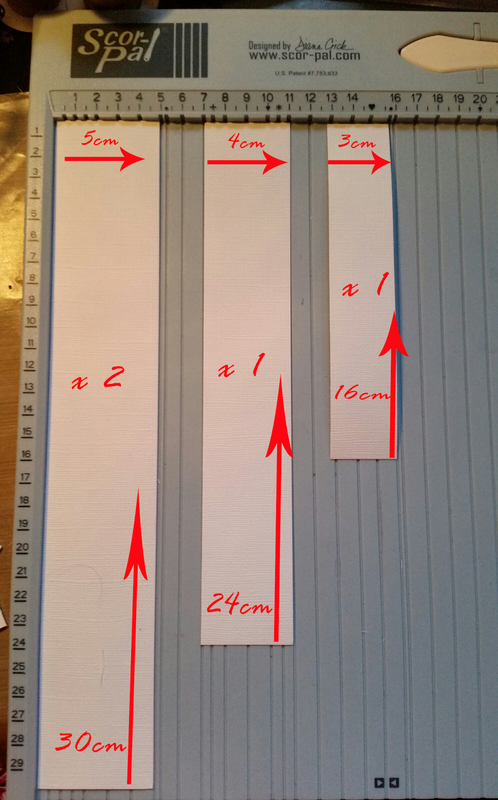 Now score in at 0,5cm ( half a cm) on both sides of the strips.... 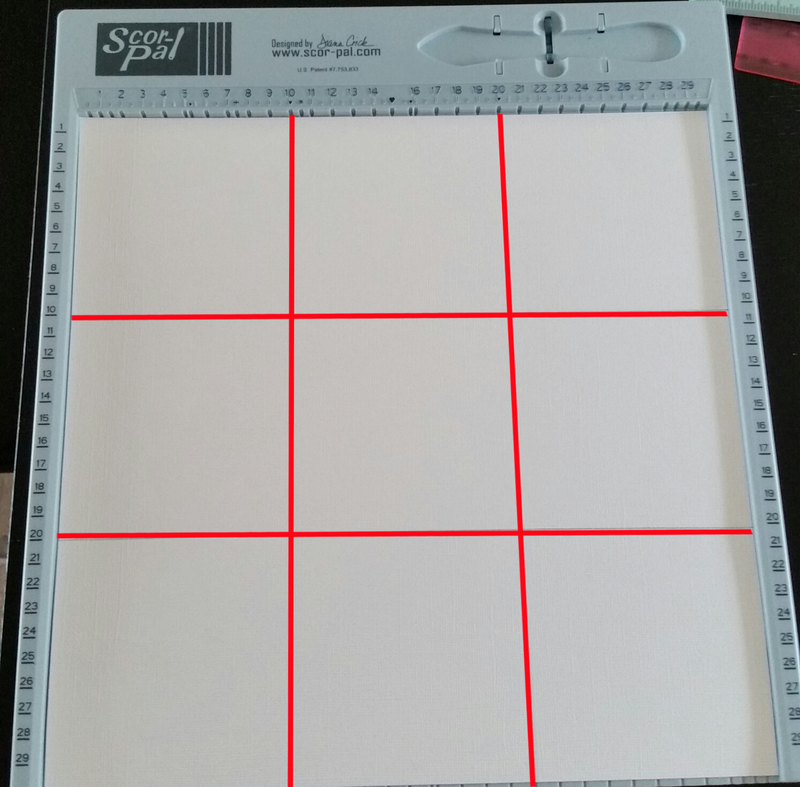 NOTE only score on one side of the two largest strips. The photo below show scoring on both sides of all the strips but you only do this if you do not want a box under your cake. Next you need to fold on your score lines. 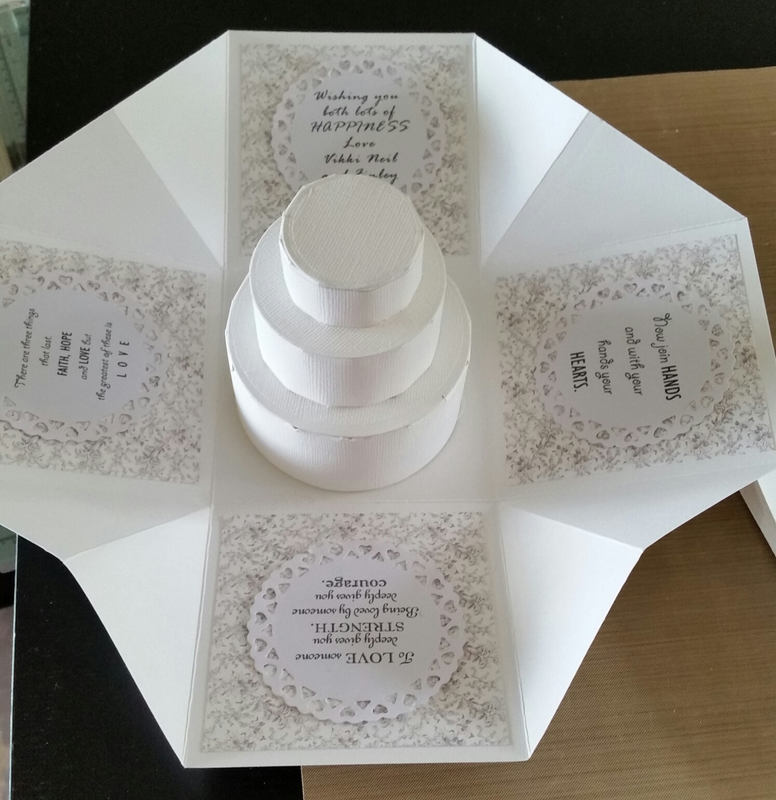 Again only on one side if you want to have a box under your cake. 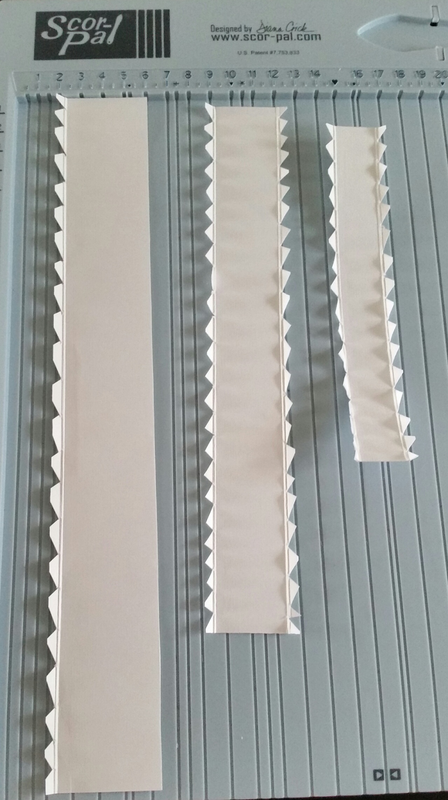 Cut your folded lines as shown in the photo below. (Yes I have it right this time ). 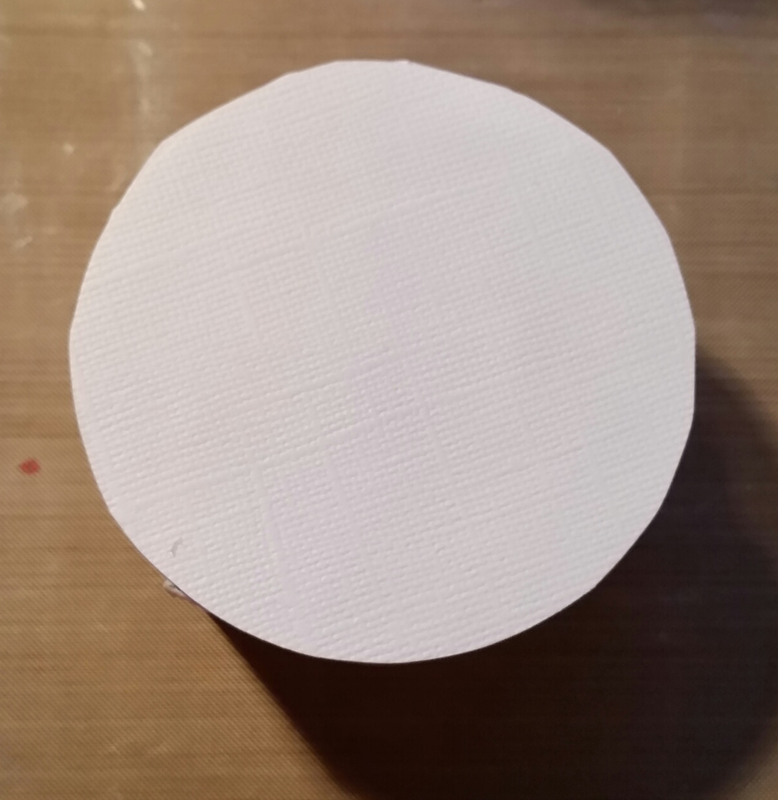 2 x 4 inch circles. 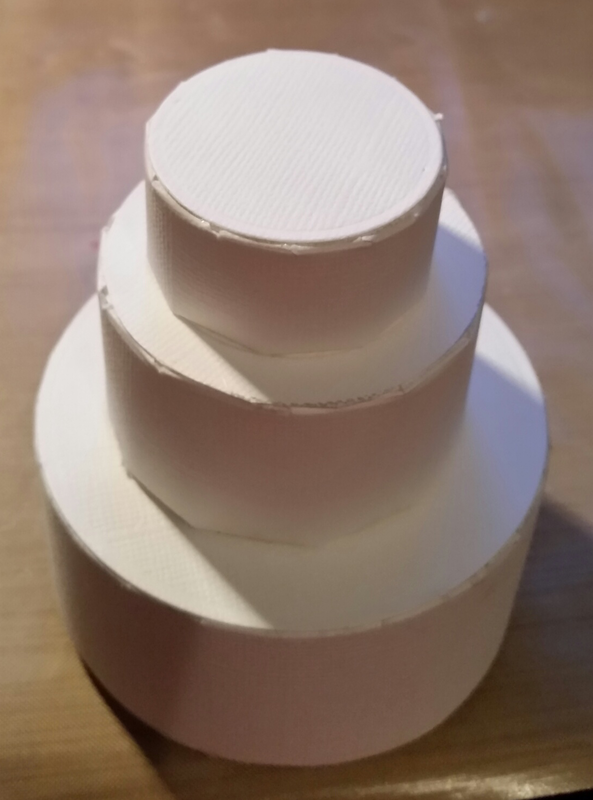 2 x 2 circles just a little smaller than your 4 inch circles ( this is going to be the base of your bottom layer) ( this is your box under the cake). Now take Your circle and Your strip and glue them together as shown in the photo below. 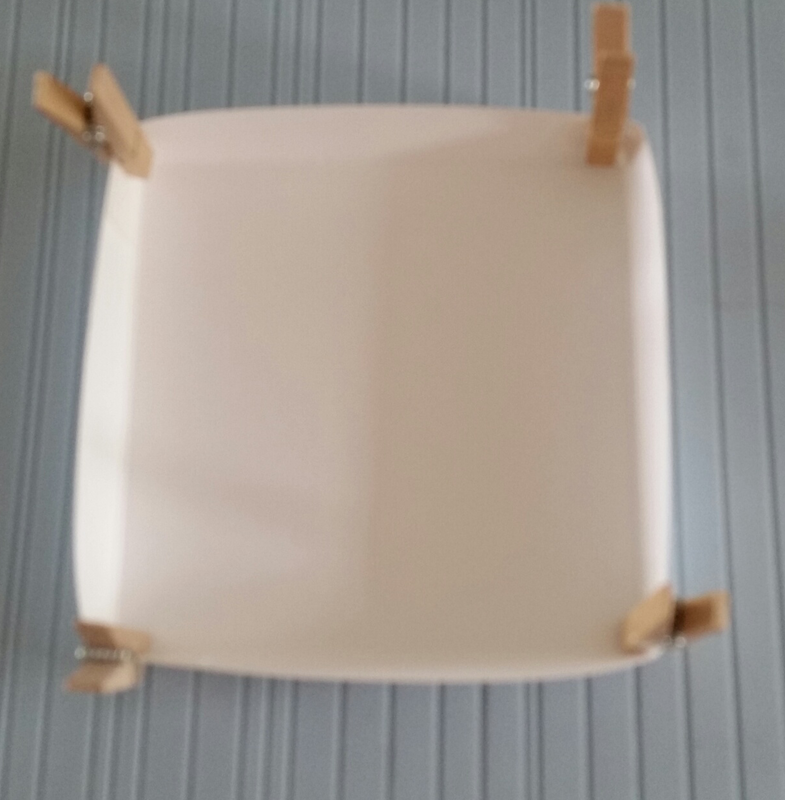 Once they are all glued then put glue another circle on top so that you hide all the edging........ As shown in the photo below. 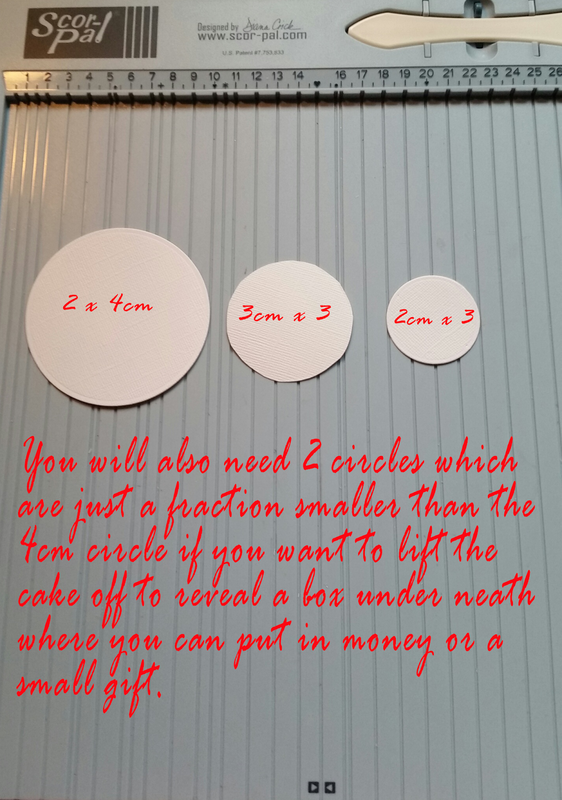 Once you are happy glue the layers of Your cake together REMEMBERING that the one size smaller than the 4cm circle is glued to the Box base and then the rest of the cake just sits on top. 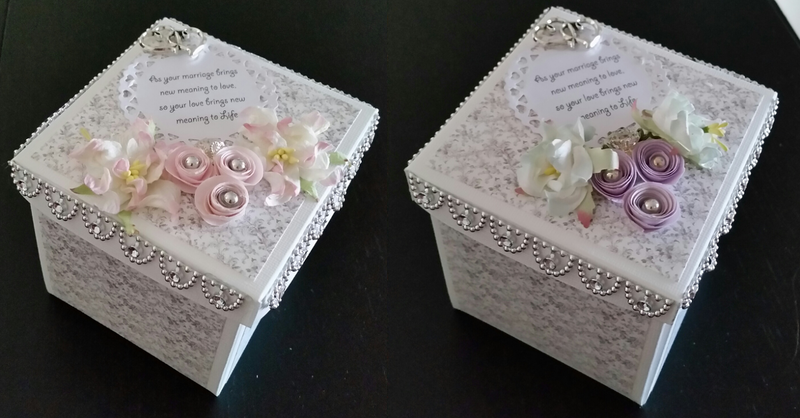 Now it's time to decorate your box..... as shown in the photo below. I have used my computer and printed out some sayings then used some dies to cut them out. I have then glued them inside the box. Here you can see how the inside of your cake. 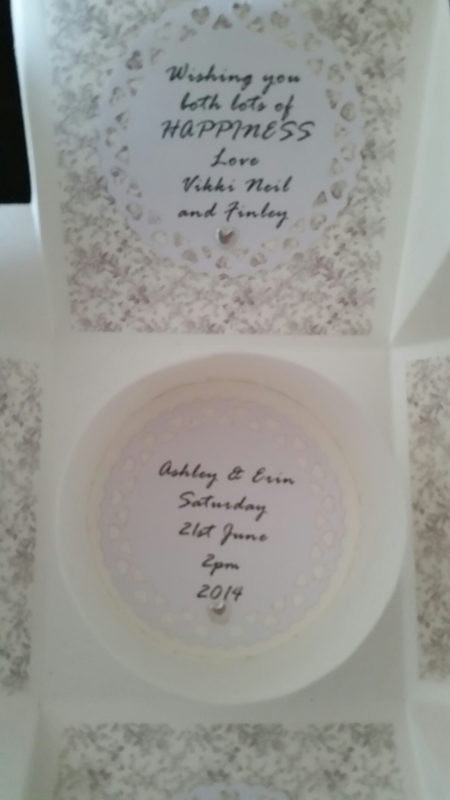 Here I have written the bride and grooms names and the date of their wedding. 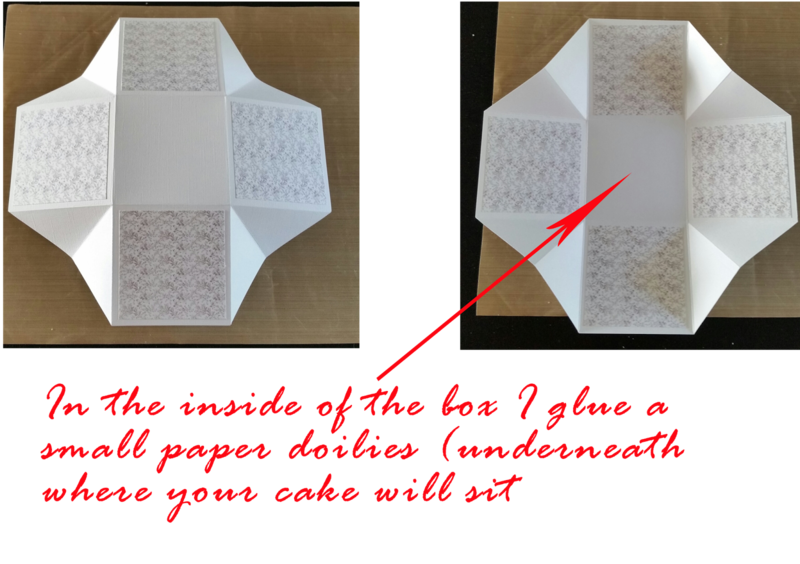 You could also put money in here or a small gift as the cake sits on top of this box. 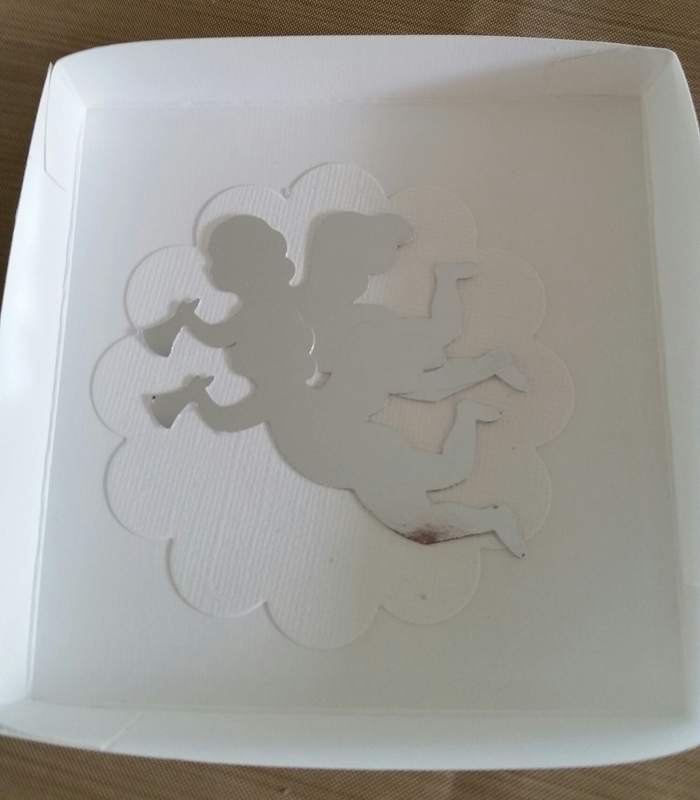 I used some mirror card and punched out these angels and I glued them inside the lid of the box. Here is my lid after it has been decorated. 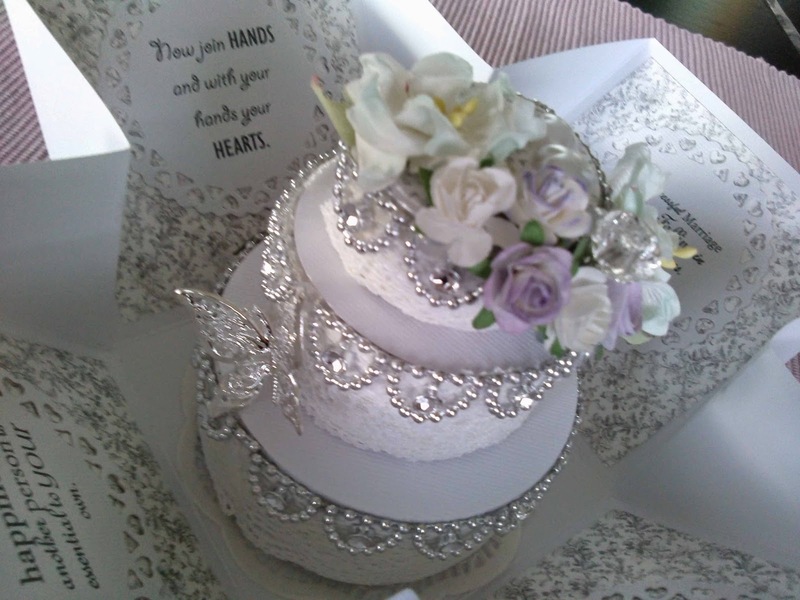 Here is my cake in the box. 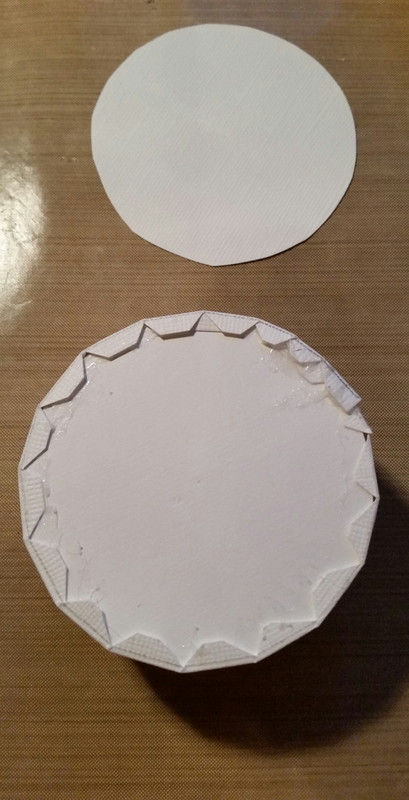 Here are two lids that are decorated. 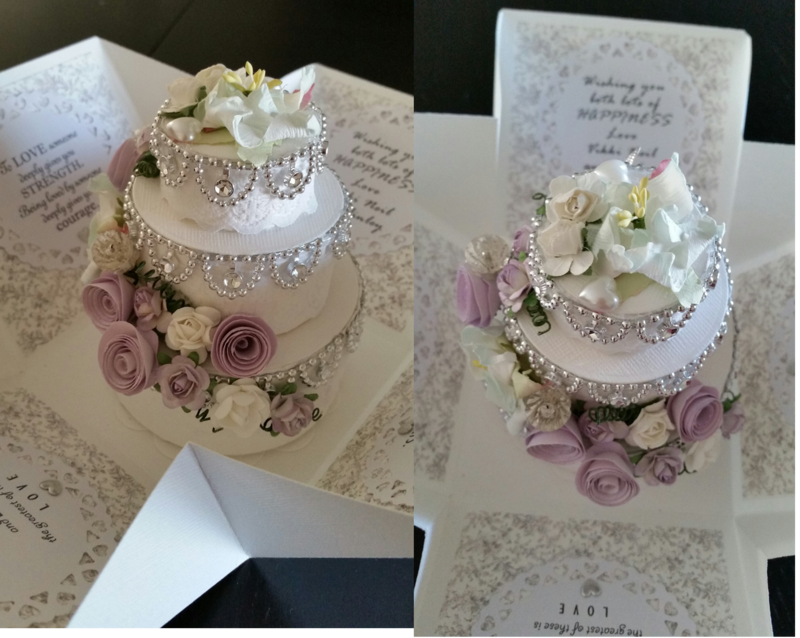 Finally here is my cake in the box. 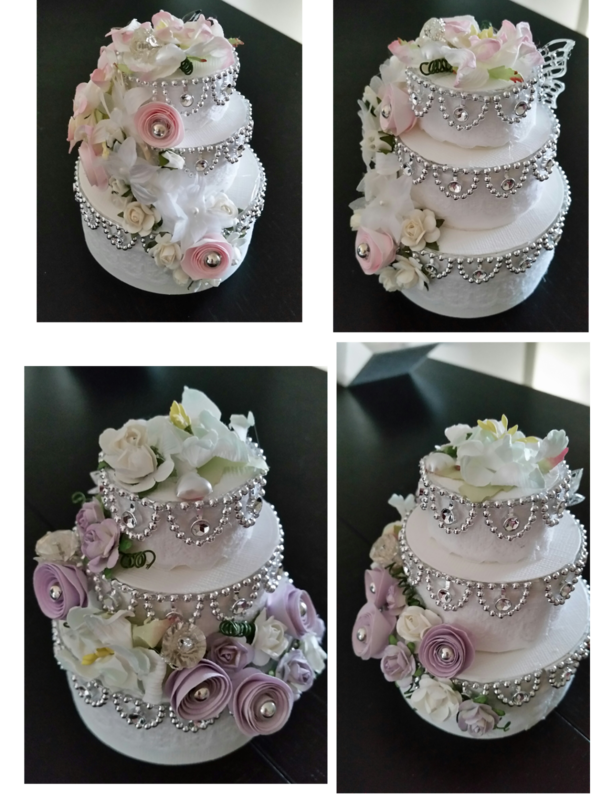 These are wedding cakes but of course you can make Your cake for any occasion. Here I have made one in blue and green. 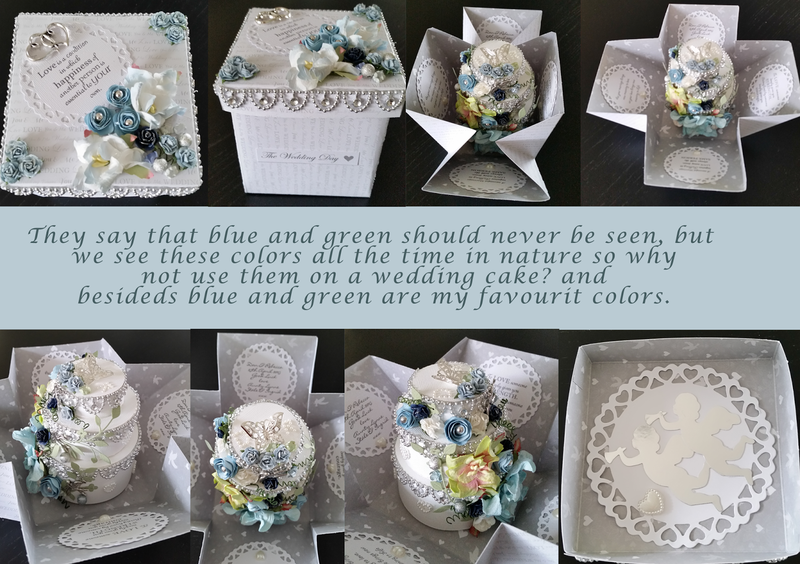 They say that blue and green should never been seen, but we see these colours every day With mother nature. Besides these are my favourite colours. I never throw away the little wire stems on flowers. 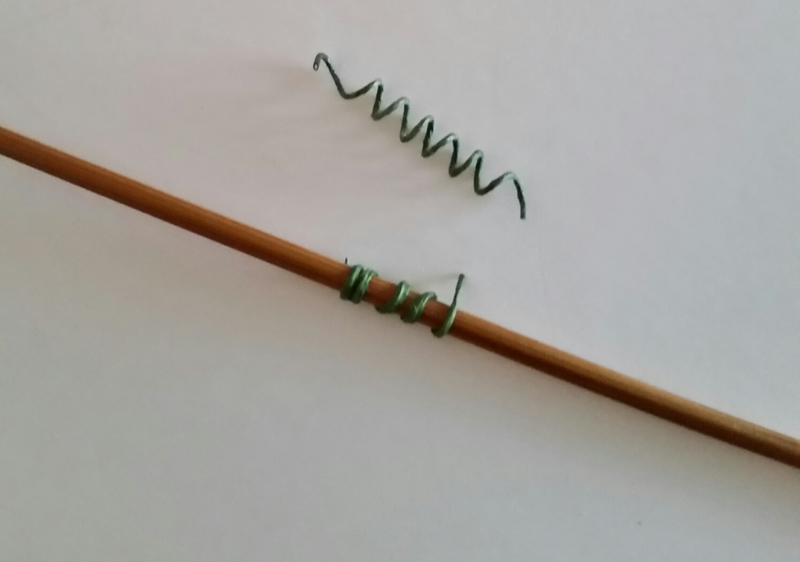 If you cut them off the flowers and twist them round a small knitting needle then slide them off, gently pull them apart a little and then you can use them in between flowers if you have any gaps. Have fun in making your cake and of course decorating it.